The creation of the Commemorative Banner dovetailed with the the 1st World War Activities Day held at Bottesford Primary School in late September 2015. Inspired by participation in the activities of that day KS2 pupils produced drawings depicting life within the community during the 1st World War and how children attending the school 100 year ago contributed to the war effort. They then worked with Sue Rowland, a Textile Artist, in transferring their work onto silk fabric in preparation for the assembly of the banner in 2016. 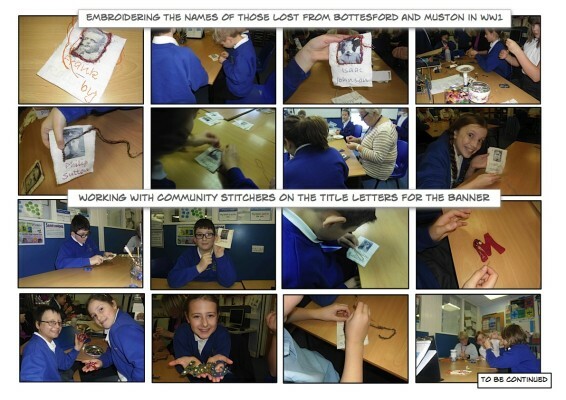 Volunteer Stitchers from the Bottesford Parish WW1 Centenary Project and the Vale of Belvoir U3A Sewing Crafts Group also assisted the pupils with their embroidering of the names of all those lost who are named on the Bottesford and Muston War Memorials. 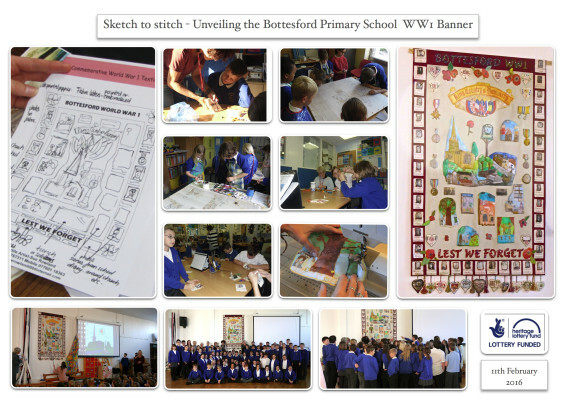 Ms. Rachel Moore, KS2 Teacher, has coordinated the work within the School and liaised with the WW1 Centenary Project. 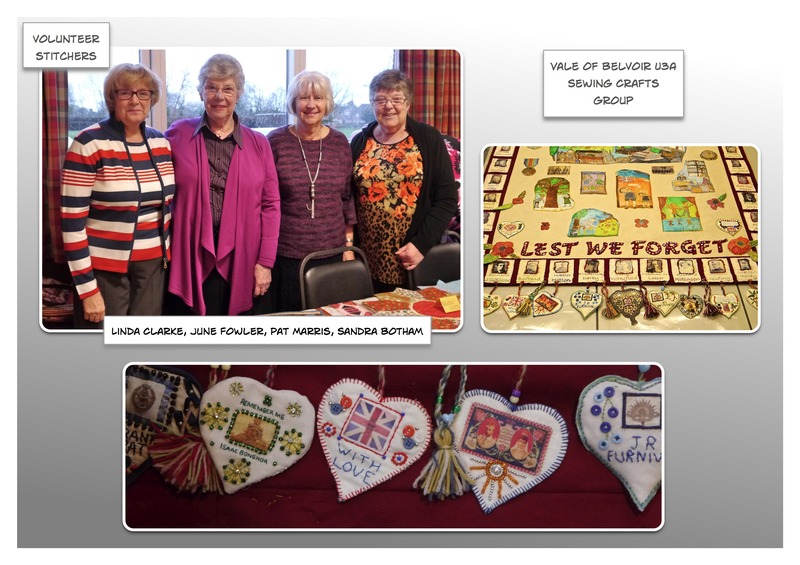 Many of those involved commented how in spending the time required to produce the art and craft work they felt they became close to the people and events depicted on their pieces. All the elements of the banner have now been completed and assembled by Sue Rowland into the final version. 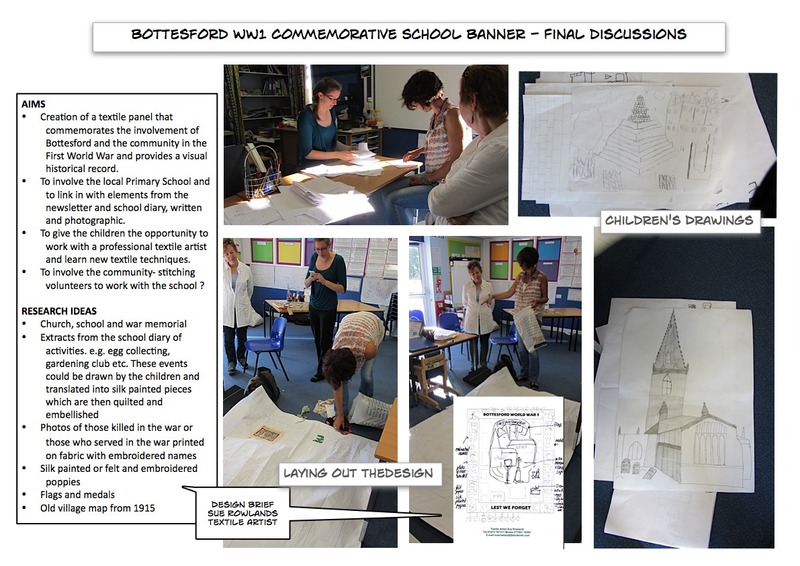 The banner will be on permanent display in the recently enlarged school hall at a Bottesford Primary School. All this work is made possible with the support of the Heritage Lottery Fund. Creation of a textile panel that commemorates the involvement of Bottesford and the community in the First World War and provides a visual historical record. 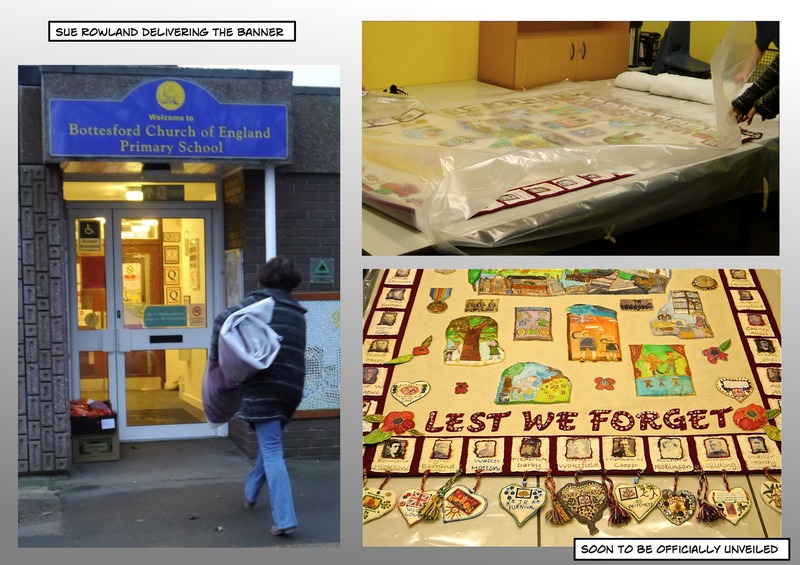 To involve the local Primary School and to link in with elements from the newsletter and school diary, written and photographic. To give the children the opportunity to work with a professional textile artist and learn new textile techniques. 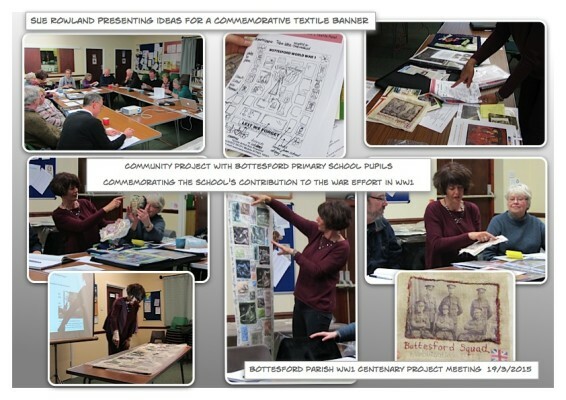 To involve the community- stitching volunteers to work with the school ? 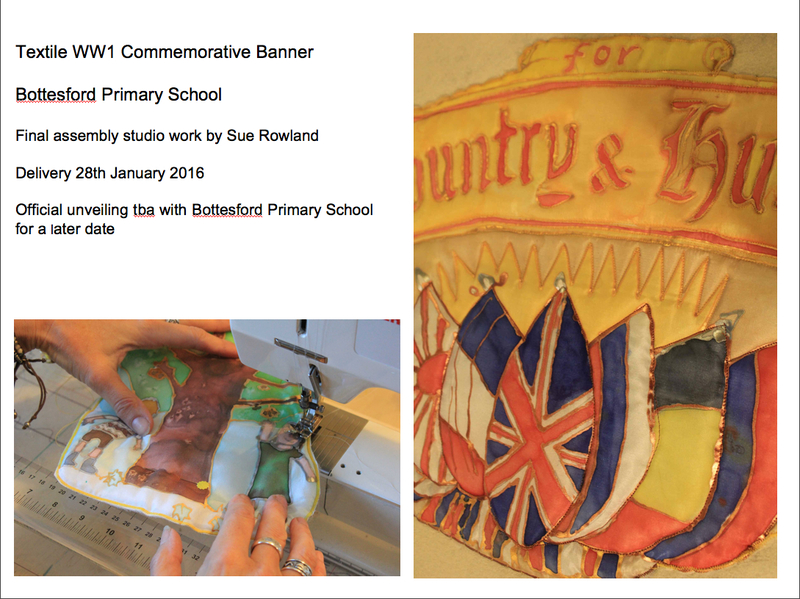 This Centenary Banner commemorates the contribution and sacrifice made by the school children and residents of Bottesford, Easthorpe, Normanton and Muston in the Great War of 1914 -18. 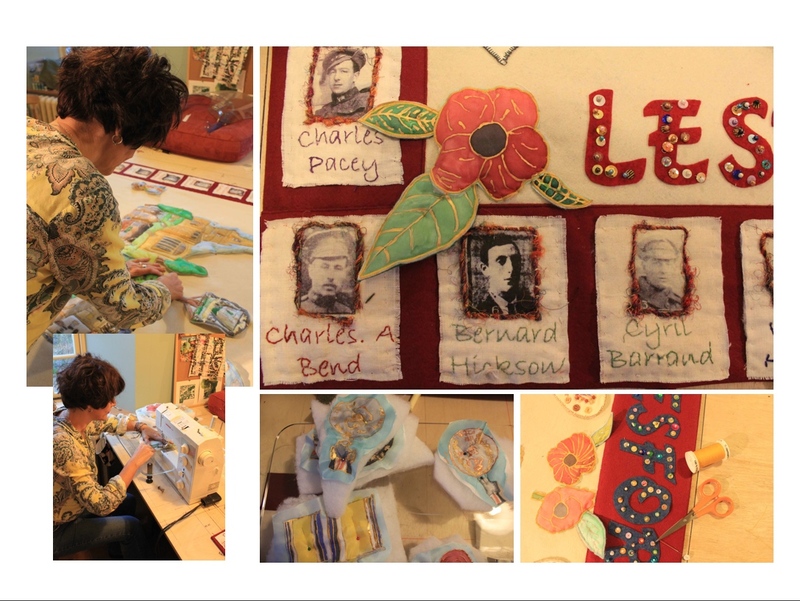 The textile artist, Sue Rowland, provided the creative direction for both the design and craftwork. The banner is the outcome of collaboration between Bottesford Primary School and the ‘Bottesford Parish 1st World War Centenary Project’ supported by an award from the Heritage Lottery Fund. Inspired by their participation in a ‘WW1 Activities Day’ in September 2015 Key Stage 2 pupils, led by KS 2 Teacher, Rachel Moore, produced the artwork and then contributed to the embroidery with the assistance of Leigh Kempson, Sharon Smith and community volunteers. We are most grateful to Sue Rowland for all the creative effort in assembling the many elements of community memory that make up this banner. Fantastic! 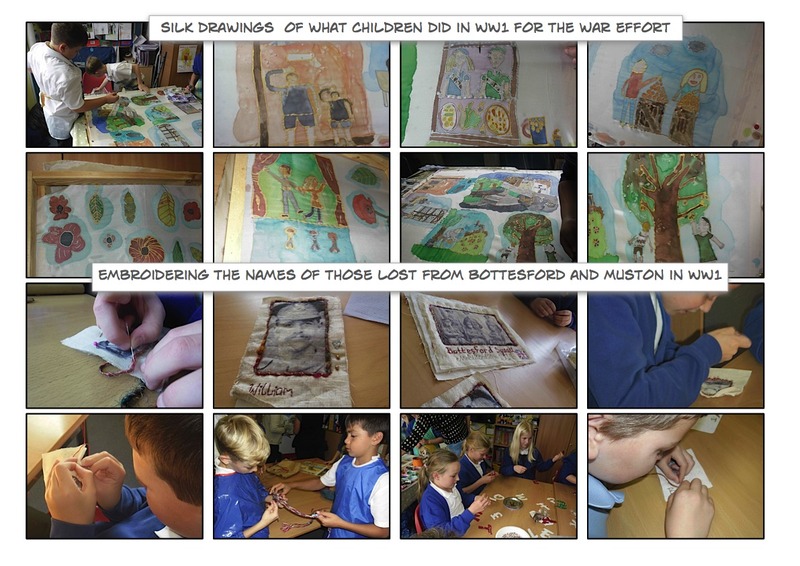 An excellent way of bringing local and world history to the children, making it meaningful and relevant to them and their village (and beyond). 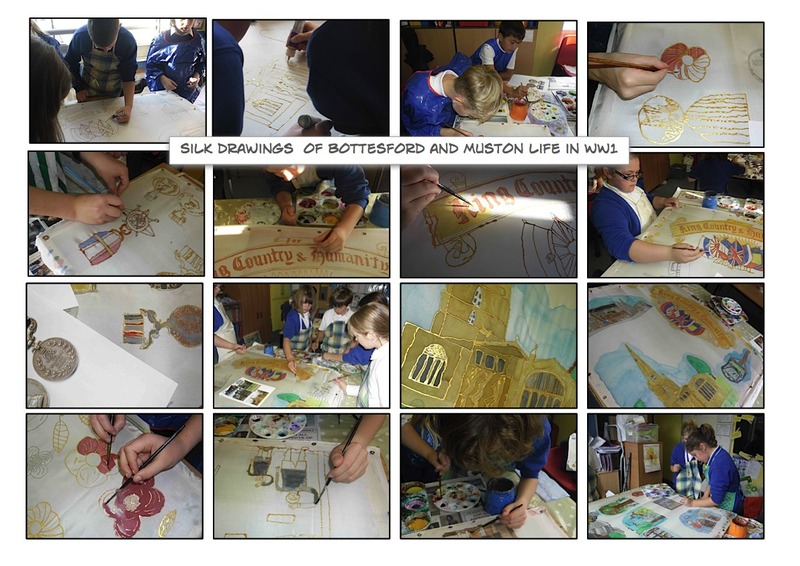 And in the best way possible – through Art! 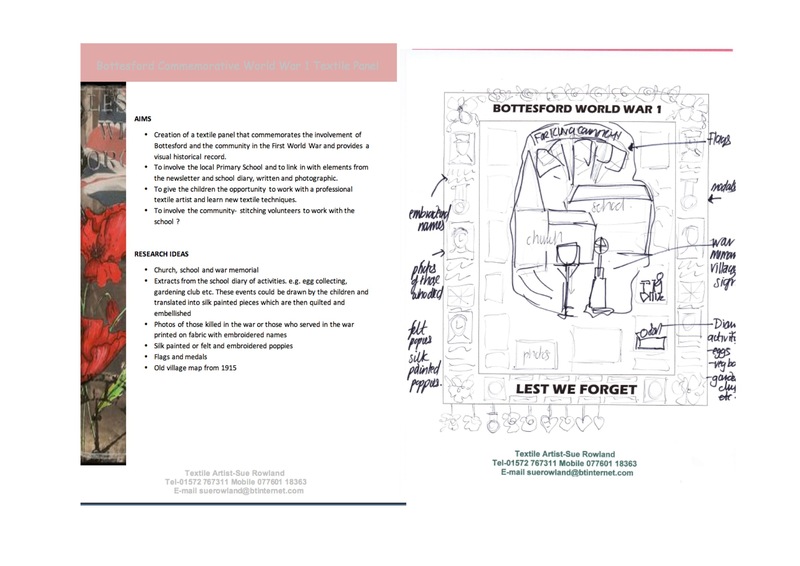 The experience will stay with some of those children for life. Congratulations to the school and Sue! So impressive! Hope the local media are aware! !